Discount retailer Five Below also climbed after it surpassed Wall Street projections in its fourth quarter. NEW YORK: U.S. stocks are broadly higher Thursday as banks recover some ground thanks to an upturn in bond yields, which will make lending money more profitable by forcing interest rates on loans higher. Over the last two days stocks have regained about half the ground they lost in Tuesday's plunge. Google's parent company, Alphabet, leads technology stocks lower as a number of companies say they will stop advertising on YouTube because they don't want their ads appearing alongside offensive videos. KEEPING SCORE: The Standard & Poor's 500 index rose 8 points, or 0.4 percent, to 2,356 as of 12:50 p.m. Eastern time. 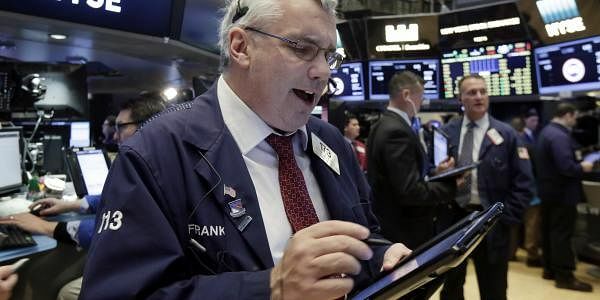 The Dow Jones industrial average added 80 points, or 0.4 percent, to 20,741. The Nasdaq composite rose 15 points, or 0.3 percent, to 5,836. The Russell 2000 index, which tracks smaller companies, gained 14 points, or 1 percent, to 1,359. Three-fourths of the stocks on the New York Stock Exchange were rising. Investors are waiting for more news about the fate of the Republican-backed health care bill, a centerpiece of President Donald Trump's business-friendly agenda of cuts to taxes and regulations and greater infrastructure spending. BONDS: Bond prices edged lower. The yield on the 10-year Treasury note, which has skidded over the last few days, rose to 2.43 percent from 2.40 percent. Banks rose more than any other sector. The S&P 500 banking index plunged 5 percent over the previous four days as bond yields and interest rates decreased. SunTrust Banks rose $1.02, or 1.9 percent, to $55.20 and Citigroup gained 78 cents, or 1.4 percent, to $58.55. YOUTUBE AD BOYCOTT: Alphabet fell as a YouTube advertising boycott spread. Companies including Johnson & Johnson, AT&T and Verizon have suspended their YouTube ad campaigns in the last week because their ads were appearing alongside offensive videos, including some that promoted terrorism. The ads are placed automatically and Google has said it will do more to block offensive videos. YouTube is one of the fastest-growing parts of Google's ad system. Alphabet lost $10.45, or 1.2 percent, to $839.35. Technology companies lagged the rest of the market, as Alphabet is the second-most valuable company on the S&P 500 after Apple. RETAIL REBOUND: PVH, which owns the Calvin Klein and Tommy Hilfiger brands, jumped after its fourth-quarter profit and sales topped analyst estimates. It said sales for the Hilfiger brand grew in the latest quarter and its business is doing well in spite of high discounts in the U.S. The stock gained $8.26, or 9.1 percent, to $99.11. Discount retailer Five Below also climbed after it surpassed Wall Street projections in its fourth quarter. The stock rose $4.42, or 11.6 percent, to $42.55. HITTING REVERSE: Ford dipped after the automaker forecast a profit of 30 to 35 cents a share in the first quarter, far below the 47 cents per share analysts expected. Ford said its profit will decrease compared to last year because of higher costs for commodities, warranties, and business investments, and lower sales volumes. The stock fell 5 cents to $11.72. ENERGY: U.S. crude oil lost 20 cents to $47.84 a barrel in New York. Brent crude, used to price international oils, remained at $50.64 a barrel in London. HEALTHCARE VOTE: Congress is scheduled to vote on the American Health Care Act Thursday, and Republican leaders are trying to hold together a coalition to pass the bill. Concessions being offered to the conservatives, who sought to limit requirements for health plans to offer certain benefits including substance abuse and maternity care, appeared to be scaring off moderate Republicans. Health care stocks were slightly higher overall. Health insurance companies were little changed while companies that administer Medicaid programs stumbled and hospital operators traded higher. UNEMPLOYMENT: More people applied for unemployment benefits last week, according to the Labor Department, but applications are still at a low level that points to a healthy job market. Benefits applications rose 15,000 last week to a seasonally adjusted 258,000. Applications are a proxy for layoffs, so the statistics suggest relatively few Americans are losing their jobs. CURRENCIES: The dollar inched up to 111.21 yen from 110.92 yen. The euro slid to $1.0784 from $1.0798. OVERSEAS: Germany's DAX jumped 1.1 percent and the CAC 40 in France rose 0.7 percent. Britain's FTSE 100 index added 0.2 percent. In Japan the Nikkei 225 gained 0.2 percent. Hong Kong's Hang Seng was flat and the South Korean Kospi gained 0.2 percent.